Click on the image or the title to view the products in each section. 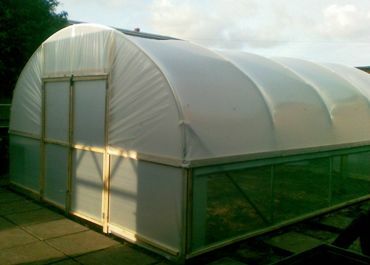 PLUS a range of options to enhance your polytunnel. With a straight side of approximately 1.15m (45") before the curve starts, our 6ft span polytunnel is not short of room at the sides. 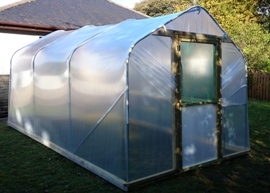 It can adequately cope with a row of cane-supported tomato plants along each side.  Galvanised high-strength steel framework - 23% stronger than Google #1 ! 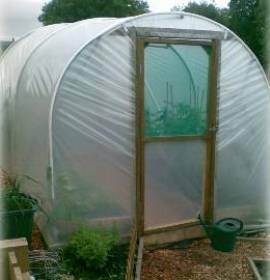 Our 10ft polytunnel is ideal for any allotment and can be used for propagation early in the season and growing full-scale throughout the rest of the season. Our 12ft span polytunnel is great for a larger allotment where you really can grow enough of everything to feed the whole family. 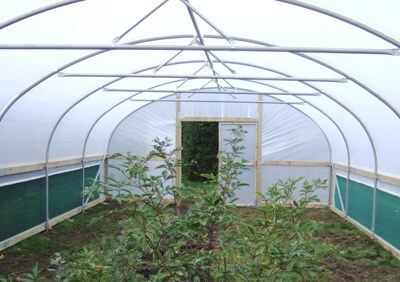 Our 16ft wide range of polytunnels use a robust 38.1mm diameter tubing for the hoops, ridge and corner struts. The steel is high tensile "Z35" grade which is galvanised and has a 1.5mm wall thickness. For our 16ft wide range, the polytunnel hoops are spaced at 6ft apart for a fast build whilst maintaining superior strength. 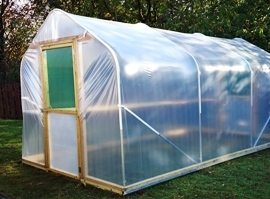 With a choice of polythene, shade net or anti-bird net, our mini-polytunnels are so versatile. 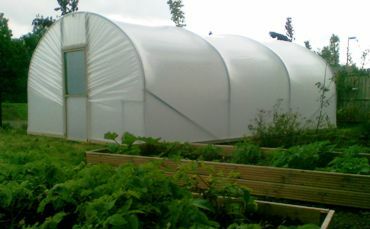 Robinson Polytunnels supply a range of polytunnel polythene and net. Buy online for next day dispatch. Not sure what size you need? Give us a call and we will confirm your exact size. 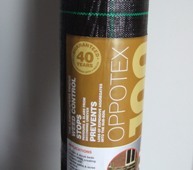 Various sundry items such as tape, narrow polythene and fasteners. A range of spare parts to suit our polytunnels and polytunnels by other manufacturers. 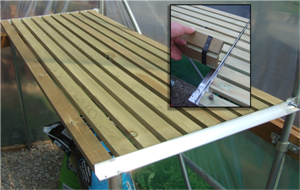 A selection of tools to make building your polytunnel a little bit easier. 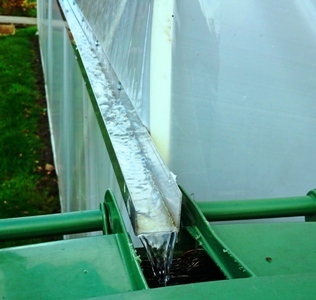 Ready to re-sheet your Polytunnel? We're the one-stop-shop to get all the bits you need to complete the job. Our robust fruit cages protect your precious crop from birds. 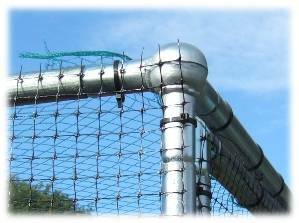 Our Fruit Cage Kits are supplied complete with woven top net, extruded side net, complete door and door posts, net fasteners, ground pegs for the side net and all required fixings. The door is supplied with its own pair of posts so you can position the door anywhere you like around the fruit cage. Also available is a range of Fruit Cage Parts to allow you to make up your own Fruit Cage to fit in the space that you have available. Our Fruit Cage Kits are supplied complete with woven top net, extruded side net, 80cm wide door and door posts, net fasteners, ground pegs for the side net and all required fixings. The door is supplied with its own pair of posts so you can position the door anywhere you like around the fruit cage. At a whopping 3.2m tall this fruit cage is ideal for protecting your larger soft fruit trees and bushes. A footprint of either 2m or 2.5m square make it the ideal size. If you don't want a complete kit you can make up your own Fruit Cage from our range of Fruit Cage Parts. Fruit Cage Net for the top and sides of your fruit cage. Our new range of Raised Beds & Cloche Hoop Kits. Net, Ground Cover, Staples and Pegs. Roll ends and ex-display items.